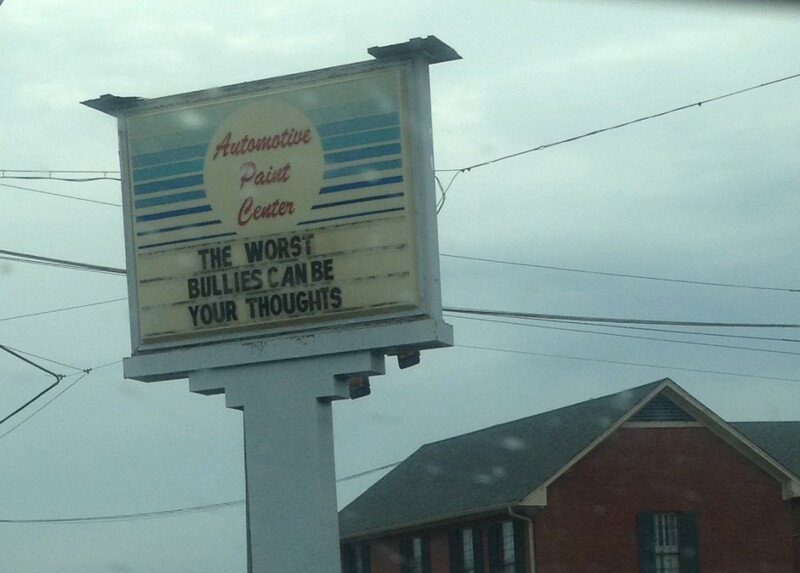 Those wily Thought Bullies – I know them all too well! It helps to know other people struggle with this (and I turn to my good friends Elizabeth Gilbert and Gretchen Rubin and Amy Poehler – I’m listening to her read her new book and it’s great – for comfort as well). My bullies especially love ganging up on me when I’m trying to fall asleep or immediately when I wake up in the morning, berating me for things I didn’t do or didn’t do well enough or did terribly. What helps me the most – and what I of course rarely feel like doing when I’m most stressed – is to get up and immediately write in my journal. For a while I was doing Morning Pages, three pages of stream-of-consciousness journaling, then I would go for a walk and start my day. It helped a ton, and I want to get back in that habit. I have never been able to make Morning Pages stick, but I do like writing a page or two before I go to bed at night to clear my head, process what happened that day, and remind myself of my victories and gratitudes. I’d like to do that more often – and exercise, too which is challenging to fit in with a todder around but a very good (research-proven!) anxiety reducer.